Neshat is the fourth of five children of wealthy parents, brought up in the religious town of Qazvin in north-western Iran under a "very warm, supportive Muslim family environment", where she learned traditional religious values through her maternal grandparents. Neshat's father was a physician and her mother a homemaker. Neshat said that her father "fantasized about the west, romanticized the west, and slowly rejected all of his own values; both her parents did. What happened, I think, was that their identity slowly dissolved, they exchanged it for comfort. It served their class". As a part of Neshat's "Westernization" she was enrolled in a Catholic boarding school in Tehran. Through her father's acceptance of Western ideologies came an acceptance of a form of western feminism. Neshat's father encouraged each of his daughters to "be an individual, to take risks, to learn, to see the world", and he sent his daughters as well as his sons to college to receive their higher education. In 1975, Neshat left Iran to study art at UC Berkeley and completed her BA, MA and MFA. Neshat graduated from UC Berkeley in 1983, where she soon moved to New York City, it was there she quickly realized that making art wasn't going to be her profession at the time. After meeting her future husband, who ran the Storefront for Art and Architecture, an alternative space in Manhattan, she dedicated 10 years of her life to working with him at the storefront, which was where her true education began. During this time, she did not make any serious attempts at creating art, and the few attempts were subsequently destroyed. She was very intimidated by the New York art scene and believed the art she was making was not substantial enough. She states "those ten years I made practically no art, and the art I did make I was dissatisfied with and eventually destroyed." In 1990, she returned to Iran, one year after Khomeini's death. "It was probably one of the most shocking experiences that I have ever had. The difference between what I had remembered from the Iranian culture and what I was witnessing was enormous. The change was both frightening and exciting; I had never been in a country that was so ideologically based. Most noticeable, of course, was the change in people's physical appearance and public behavior." As the Storefront ran like a cultural laboratory, she was exposed to creators like artists, architects, and philosophers; she asserts Storefront eventually helped kickstart her passion for art again, making her think deeply about herself and what she wanted to create as an artist. In 1993 Neshat began seriously to make art again, starting with photography. Neshat's earliest works were photographs, such as the Unveiling (1993) and Women of Allah (1993–97) series, which explore notions of femininity in relation to Islamic fundamentalism and militancy in her home country. As a way of coping with the discrepancy between the culture that she was experiencing and that of the pre-revolution Iran in which she was raised, she began her first mature body of work, the Women of Allah series, portraits of women entirely overlaid by Persian calligraphy. Her work refers to the social, cultural and religious codes of Muslim societies and the complexity of certain oppositions, such as man and woman. Neshat often emphasizes this theme showing two or more coordinated films concurrently, creating stark visual contrasts through motifs such as light and dark, black and white, male and female. Neshat has also made more traditional narrative short films, such as Zarin. The work of Neshat addresses the social, political and psychological dimensions of women's experience in contemporary Islamic societies. Although Neshat actively resists stereotypical representations of Islam, her artistic objectives are not explicitly polemical. Rather, her work recognizes the complex intellectual and religious forces shaping the identity of Muslim women throughout the world. Using Persian poetry and calligraphy she examined concepts such as martyrdom, the space of exile, the issues of identity and femininity. When Neshat first came to use film, she was influenced by the work of Iranian director Abbas Kiarostami. She directed several videos, among them Anchorage (1996) and, projected on two opposing walls: Shadow under the Web (1997), Turbulent (1998), Rapture (1999) and Soliloquy (1999). Neshat's recognition became more international in 1999, when she won the International Award of the XLVIII Venice Biennale with Turbulent and Rapture, a project involving almost 250 extras and produced by the Galerie Jérôme de Noirmont which met with critical and public success after its worldwide avant-première at the Art Institute of Chicago in May 1999. With Rapture, Neshat tried for the first time to make pure photography with the intent of creating an aesthetic, poetic, and emotional shock. Games of Desire, a video and still-photography piece, was displayed between September 3 and October 3 at the Gladstone Gallery in Brussels before moving in November to the Galerie Jérôme de Noirmont in Paris. The film, which is based in Laos, centers on a small group of elderly people who sing folk songs with sexual lyrics - a practice which had been nearing obsolescence. In 2009 she won the Silver Lion for best director at the 66th Venice Film Festival for her directorial debut Women Without Men, based on Shahrnush Parsipur's novel of the same name. She said about the movie: "This has been a labour of love for six years. ... This film speaks to the world and to my country." The film examines the 1953 British-American backed coup, which supplanted Iran's democratically elected government with a monarchy. 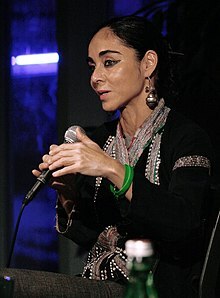 Since her first solo exhibition, at Franklin Furnace in New York in 1993, Neshat has been featured in solo exhibitions at the Museo de Arte Moderno, Mexico City; Contemporary Arts Museum, Houston; Walker Art Center, Minneapolis (2002); Castello di Rivoli, Turin; Dallas Museum of Art (2000); Wexner Center for the Arts, Columbus; the Art Institute of Chicago; the Serpentine Gallery, London; Museo de Arte Contemporáneo de Castilla y León, León; and the Hamburger Bahnhof, Berlin (2005). In 2008, her solo exhibition "Women Without Men" opened at the ARoS Aarhus Kunstmuseum, Denmark, and traveled to the National Museum of Contemporary Art, Athens, and to the Kulturhuset, Stockholm. She was included in Prospect.1, the 2008 New Orleans Biennial, documenta XI, the 2000 Whitney Biennial, and the 1999 Venice Biennale. In 2012 Shirin Neshat had a Solo Exhibition in Singapore, Game of Desire at Art Plural Gallery. Also in 2012, Shirin Neshat's photo, Speechless was purchased and exhibited by the Los Angeles County Museum of Art. A major retrospective of Neshat's work, organized by the Detroit Institute of Arts, was scheduled to open in 2013. Neshat was artist in residence at the Wexner Center for the Arts (2000) and at MASS MoCA (2001). In 2004 she was awarded an honorary professorship at the Universität der Künste, Berlin. In 2006 she was awarded The Dorothy and Lillian Gish Prize, one of the richest prizes in the arts, given annually to "a man or woman who has made an outstanding contribution to the beauty of the world and to mankind's enjoyment and understanding of life." Cindy Sherman was the first person to buy Neshat's work, at Annina Nosei Gallery in 1995. At the 2017 Salzburg Festival Neshat directed Giuseppe Verdi's opera Aida, with Riccardo Muti as conductor and Anna Netrebko singing the main character. Asked by the festival organizers about the particular challenge for an Iranian woman to stage a play that deals with the threats of political obedience and religion to private life and love, Neshat said "Sometimes the boundaries between Aida and myself are blurred." Tooba, 2002. Two channel video/audio installation based on Shahrnush Parsipur's novel Women Without Men. Munis, 2008. Color video/audio installation based on Shahrnush Parsipur's novel Women Without Men. Faezeh, 2008. Color video/audio installation based on Shahrnush Parsipur's novel Women Without Men. Women Without Men, 2009. Feature film based on Shahrnush Parsipur's novel Women Without Men. Looking for Oum Kulthum, 2017, film. Expressing the inexpressible [videorecording DVD]: Shirin Neshat. 2004, 42 minutes, Color. Princeton, NJ: Films for the Humanities & Sciences. Originally produced by Westdeutscher Rundfunk in 2000. ^ a b Holzwarth, Hans W. (2009). 100 Contemporary Artists A-Z (Taschen's 25th anniversary special ed.). Köln: Taschen. pp. 416–421. ISBN 978-3-8365-1490-3. ^ a b Elaine Louie (January 28, 2009). "A Minimalist Loft, Accessorized Like Its Owner". The New York Times. ^ "Shirin Neshat". THE SOLOMON R. GUGGENHEIM FOUNDATION. Retrieved 13 September 2017. ^ "Shirin Neshat". International Center of Photography. 2 March 2016. Retrieved 13 September 2017. ^ Claudia La Rocco (November 14, 2011). "Shirin Neshat's Performa Contribution". The New York Times. Retrieved February 8, 2012. ^ Müller, Katrin Bettina. "Away overseas". Shirin Neshat artist portrait. Archived from the original on March 3, 2016. Retrieved March 5, 2016. ^ a b c Susan Horsburgh (March 26, 2001). "The Great Divide". Time. ^ a b Homa Khaleeli (June 13, 2010). "Shirin Neshat: A long way from home". The Guardian. ^ a b Denson, G. Roger, "Shirin Neshat: Artist of the Decade", The Huffington Post, December 20, 2010. ^ a b c Suzie Mackenzie (July 22, 2000). "An unveiling". The Guardian. ^ a b MacDonald, Scott (September 22, 2004). "Between two worlds: an interview with Shirin Neshat". Highbeam.com. Archived from the original on May 11, 2013. Retrieved March 29, 2012. ^ Heartney, Eleanor (2007). After the Revolution: Women Who Transformed Contemporary Art. Munich: Prestel. pp. 230–231. ISBN 9783791337326. ^ a b c Danto, Arthur Coleman. "Shirin Neshat." ["interview"]. Bomb, no. 73, 15 Oct. 2000, pp. 60-67. EBSCOhost, search.ebscohost.com/login.aspx?direct=true&db=asu&AN=505875156&site=ehost-live. ^ Excerpt from interview between the artist and Linda Weintraub, author of In the Making: Creative Options for Contemporary Art. ^ a b Shirin Neshat Guggenheim Collection. ^ Danto, Arthur C. "Shirin Neshat", Bomb, Fall 2000. Retrieved June 27, 2012. ^ "The Woman Behind the Screen". The New Yorker. October 22, 2007. ^ a b c Orden, Erica. "Snapshot of a Song", Modern Painters, November 2009. ^ Livia Bloom (January 23, 2010). "Women Without Men's Shirin Neshat". Filmmaker. ^ Sabina Castelfranco (September 13, 2009). "Shirin Neshat Wins Best Director Award at Venice Film Festival". Payvand.com. ^ "Shirin Neshat - Franklin Furnace". Retrieved 2019-03-07. ^ "Games of Desire to be exhibited at Art Plural Gallery", Singapore Business Review, October 9, 2012. Retrieved October 2013. ^ "New Acquisition: Shirin Neshat, Speechless | Unframed". unframed.lacma.org. Retrieved 2019-03-07. ^ Shirin Neshat: The Book of Kings, January 13 – February 11, 2012 Archived June 27, 2012, at the Wayback Machine, Gladstone Gallery, New York. ^ Neshat, Shirin (1997). Women of Allah. United States. ^ Neshat, Shirin (2000). Two Installations. Wexner Center For The Arts. ISBN 9781881390268. ^ Neshat, Shirin (October 15, 2005). Shirin Neshat: 2002-2005. Charta. ISBN 8881585405. ^ Neshat, Shirin (2011). I Know Something about Love. ^ Neshat, Shirin (2003). Shirin Neshat: Toba. ^ Shirin Neshat, 1 October - 4 December 2005 Archived 9 November 2013 at the Wayback Machine, Hamburger Bahnhof, Berlin. ^ "The Dorothy and Lillian Gish Prize". Gishprize.com. 2006. Archived from the original on 2012-11-05. ^ London, Bianca (November 30, 2015). "Pirelli with fewer nudes: Serena Williams, Patti Smith and Amy Schumer pose for iconic calendar as it abandons naked supermodels for 'women of achievement'". Daily Mail. ^ Ted Loos (February 21, 2012), Art Becomes Her: In Honor of Cindy Sherman’s MoMA Retrospective, Five Tastemakers Reflect on Her Influence Archived 2012-05-18 at the Wayback Machine Vogue. ^ New York Times (August 7, 2017), Review: Anna Netrebko Sings Her First ‘Aida’ in Salzburg NYT. Wikimedia Commons has media related to Shirin Neshat.